50 years ago today, John F. Kennedy was murdered while traveling through Dealey Plaza in Dallas, Texas. That day I was eight years old, a gangly kid in a green plaid Catholic School uniform, knee socks that never stayed up. I was sitting in a third grade classroom at St. Aloysius School in Caldwell, New Jersey, a papist fortress parked next to Grover Cleveland's birthplace. One of our own was President of the United States. My born-in-Ireland grandmother had a plate hanging proudly on her kitchen wall that showed the Kennedy family leaving church after Mass. As good as the Pope to have Jack in the White House. It was a Friday afternoon. We had our book bags packed, coats on, waiting to be dismissed to our buses. The principal, a nun, came over the intercom: "Turn your TVs on. It is something about the President." We learned that the President has been shot. Our teacher put her hand to her mouth in disbelief. We knew it was serious. It was a quiet bus ride home, odd for repressed kids at the end of a school week. Silent. No rowdiness. Where the bus stopped for us was a couple of blocks from our house. As Fran, Kev and I got off the bus, and walked around the corner, we saw our mother standing at the edge of our driveway, waiting for us. We were what she needed at that moment. And she was the place that always felt safe. On a black and white TV, we watched Walter Cronkite take off his glasses, look at the camera and say, "President Kennedy died at 1 p.m. Central Standard Time. 2 o'clock Eastern Standard Time, some 38 minutes ago." He then stopped speaking, put his glasses back on, and swallowed hard to keep from crying. On that same TV, we saw another man named Jack shoot Lee Harvey Oswald. A tall man in a white suit and sheriff's hat grimaced. Jack Ruby died from stomach cancer four years later. 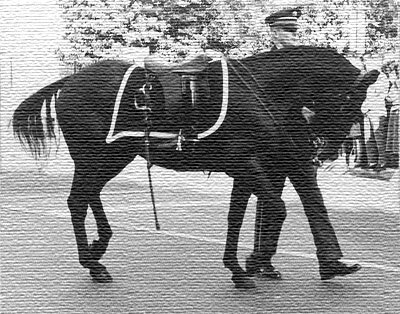 And Black Jack, a coal-black 16-year-old quarter horse, escorted by a member of the Old Guard down Pennsylvania Avenue, carried boots facing backward in the stirrups, symbol of a fallen leader. Black Jack was spooked, and pranced. He is one of only two horses in United States history to be buried with full military honors. He rests in a corner of Summerall Field in Fort Myer, Virginia. And it was the first time I ever saw my father cry. That night, when I got out of bed to use the bathroom, I saw him sitting at the kitchen table, holding my mother's hand. They wept together. Years ago my friends Gail and Mike took me to Dealey Plaza. It seemed like such a small place. A man with wild eyes walked up to us with a worn piece of paper containing a sketch depicting Jack Kennedy's head with a section blown off. "This is what happened," he told us. "There was more than one shooter." But one story that stands out is Doug's memory of meeting Jack Kennedy one day in North Andover, MA. Kennedy was a Senator, Doug a ten-year-old boy. Kennedy and Jackie had come to the neighborhood to pay respects to a local political boss. All the children ran to shake his hand, except Doug, who felt shy. Jack Kennedy walked up to Doug, his hand extended, which Doug refused to shake. "He was so charismatic it frightened me," Doug says. Kennedy turned to Jackie, smiled that smile, and said, "He won't shake my hand."